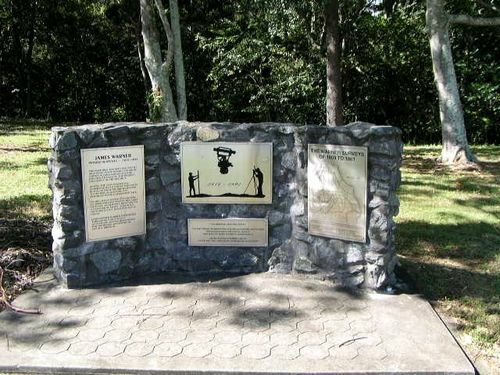 A monument commemorates pioneer surveyor, James Warner. Warner surveyed towns and rural selections near Brisbane. In 1846 he was sent to trace the River Boyne from its source and to mark latitude 26 degrees, the southern boundary of the short-lived colony of North Australia, centred on Port Curtis. In January 1861 Warner produced, for sale, a large coloured map of Brisbane, which he exhibited at the Town Hall. It ran to a second edition in 1871. Upon the formation of the Queensland Institute of Surveyors in 1875, he was its first secretary and treasurer.